Thanks to the Labor Day holiday, I got to enjoy a three-day weekend with George. 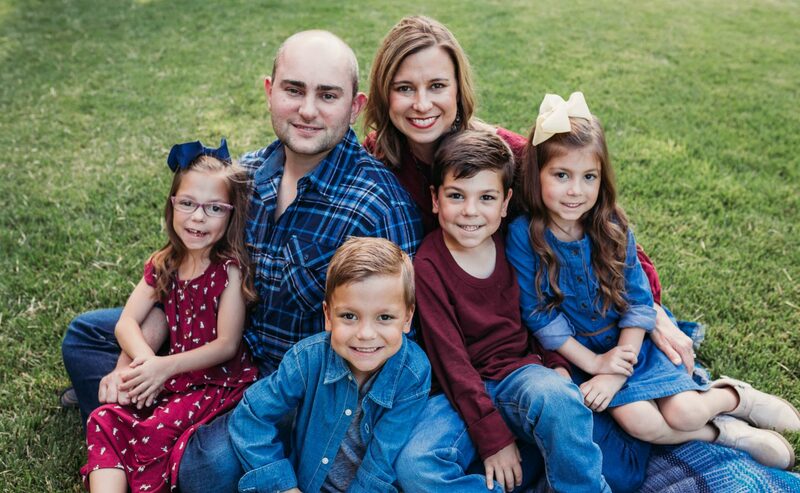 My favorite days are those when the six of us are all together. Life seems much simpler when George and I are cohesive team and I feel far more productive with him. In honor of our time together, George and I set our sights on trying something new with the babies each day. 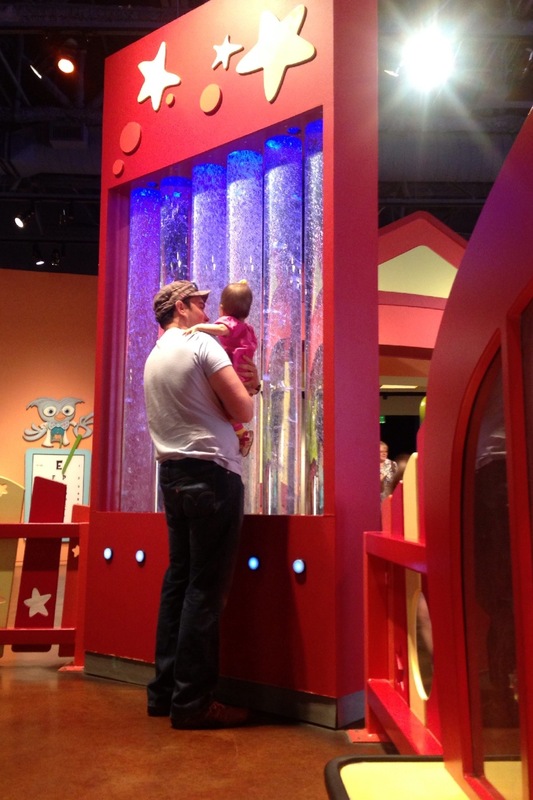 All summer we considered taking the babies to the Children’s Museum, but never had the moxie. When Saturday afternoon rolled around, we mustered the courage to go even with a high likelihood of a packed house. Despite the holiday weekend, the museum wasn’t terribly crowded and was easy for us to navigate with two twin strollers. 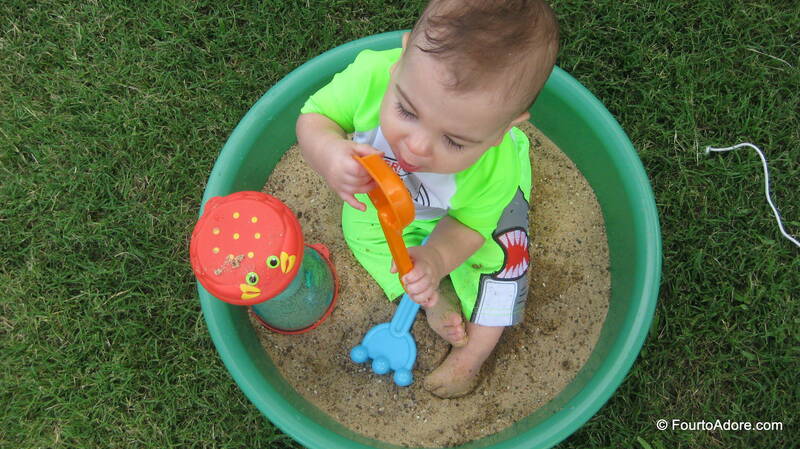 We began in the infant/ toddler area where the babies could roam freely. There, we explored cause/ effect with a switch activated machine. Then, the babies crawled in a padded circle to view critters in a terrarium. Unfortunately, the inhabitants of these terrariums weren’t energetic enough to capture the babies’ attention. 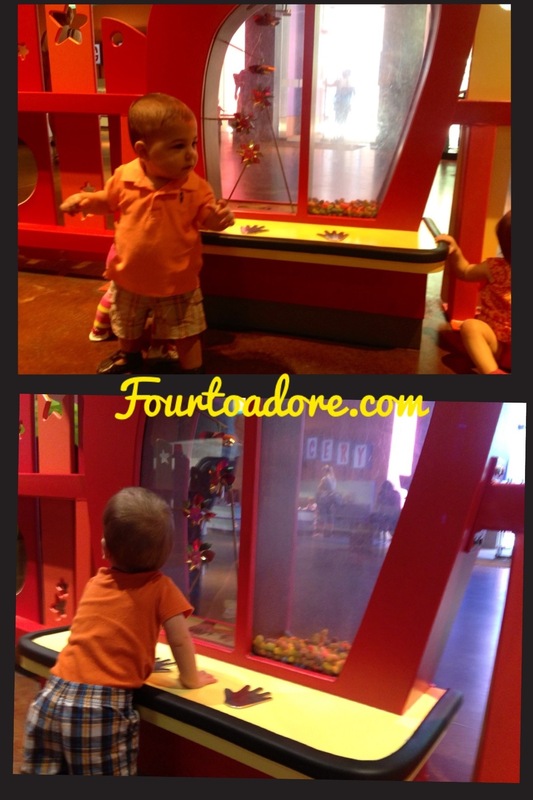 After a romp in the baby area, we whisked through the remaining exhibits. 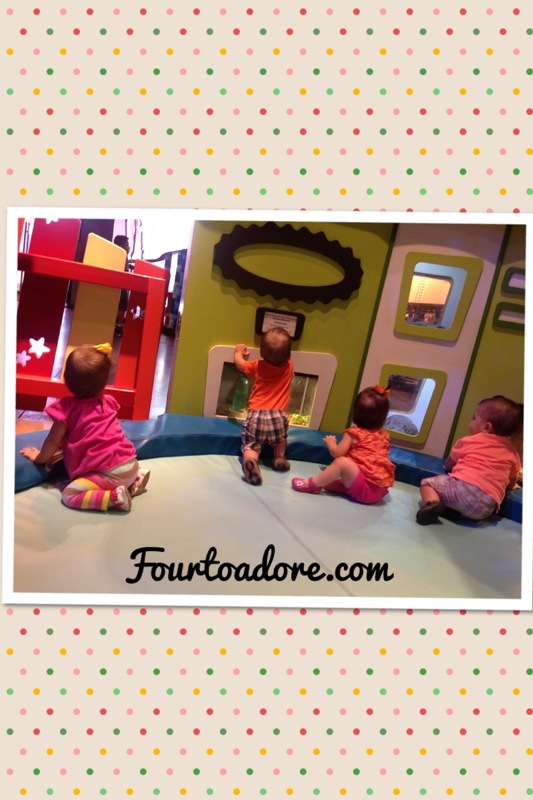 Although most of the museum was a bit above the babies’ comprehension level, they seemed content to stroll about in air conditioning while seeing novelties. Sydney was captivated by the bubbles and lights. 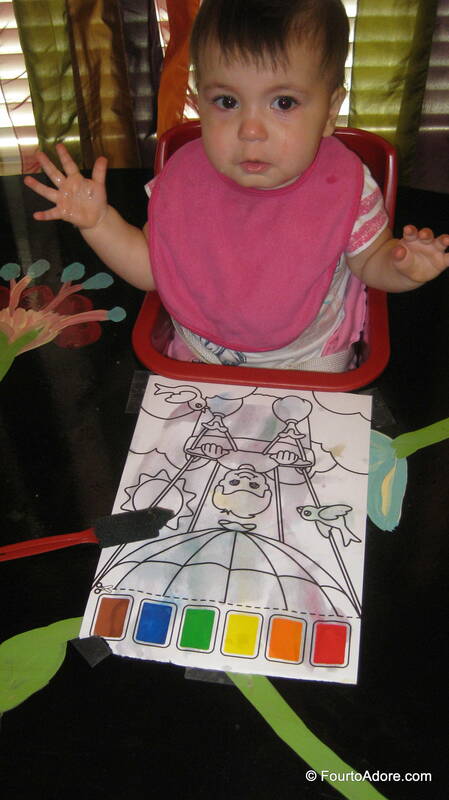 The babies enjoyed watching the pin wheels spin and pom poms float when they activated the switch. When we were done in this area, I washed their little hands thoroughly. I managed to find shoes for everyone in storage. Now that the babies are mobile, they need footwear for public outings! In my opinion, Labor Day weekend is never complete without grilled food and a final dip in the pool. After all, it’s the official mark to summer’s end. 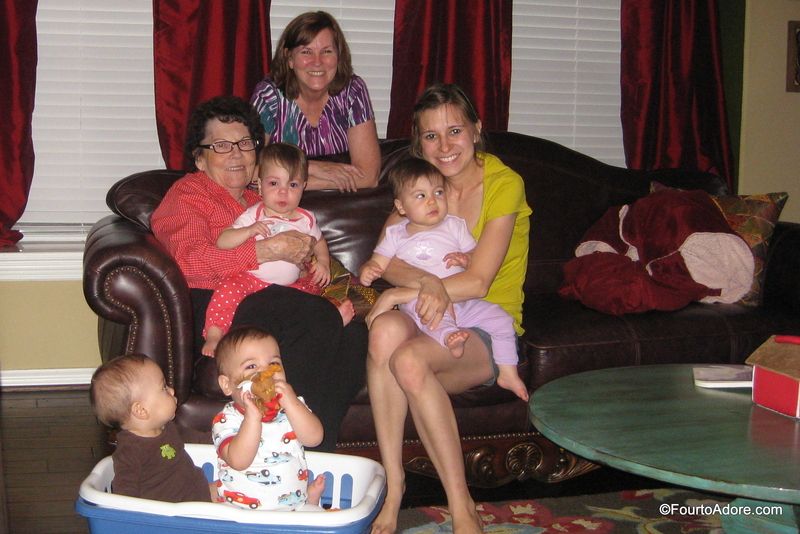 We invited my parents and grandmother to help us honor this tried and true traditions. 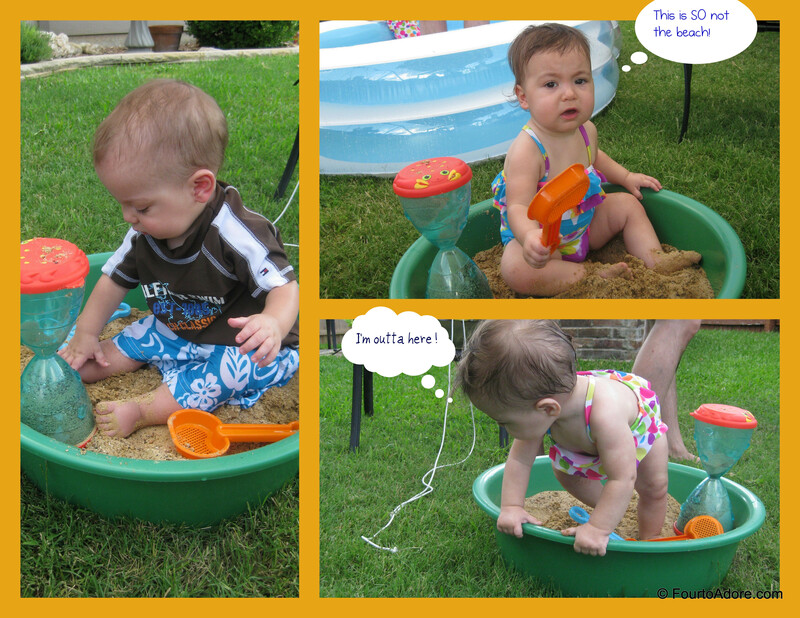 The babies were no strangers to the pool, but this was the first time in a kiddie pool. 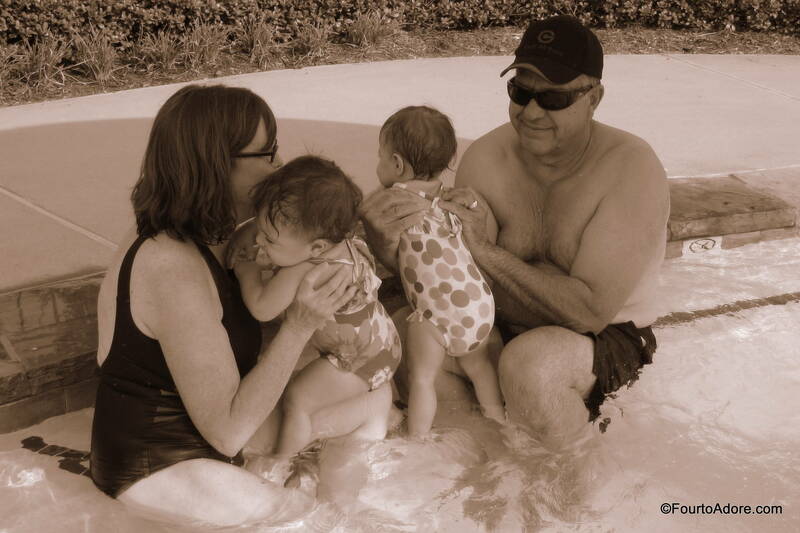 With the help of my parents, the babies experienced the joys of an over sized shallow pool. 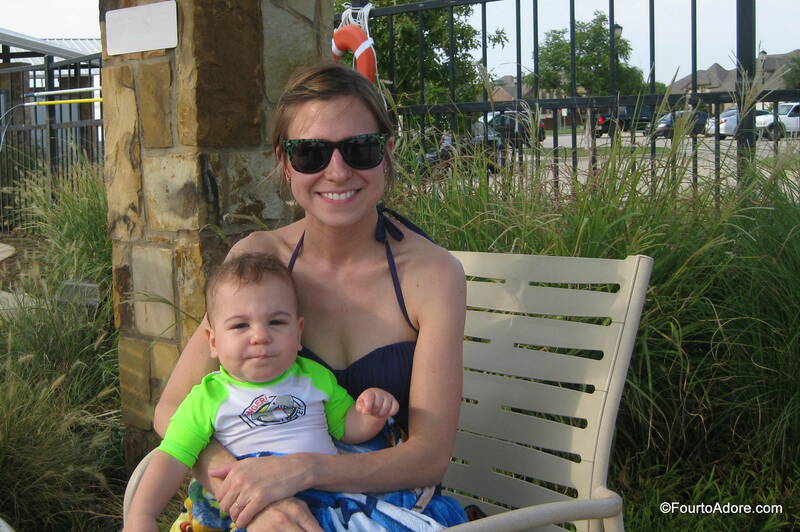 Unlike our other trips to the pool, Mason seemed happy swimming since he could stand up and control where he ventured. George was really pleased we made at least one trip to our community pool. Since we pay astronomical Home Owner’s Association fees, he feels better when we use the ammenities. At first, the rain shower mushroom startled the babies, but soon enough it was fascinating. George was in charge of Sydney’s swim attire and sunscreen. 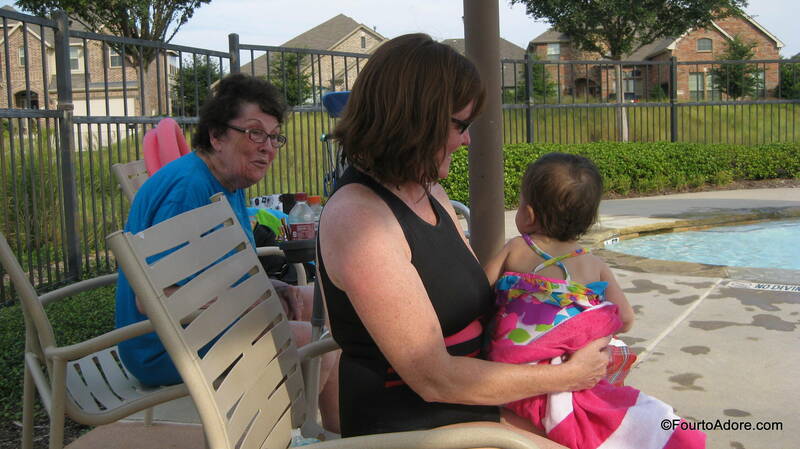 About 20 minutes into our swim time, I noticed her hiney ballooning out, apparently he forgot the swim diaper. Luvs are VERY water absorbent to say the least. Harper enjoyed a little Mommy time. Rylin blew Grandma kisses and said, “Hi!” to her. 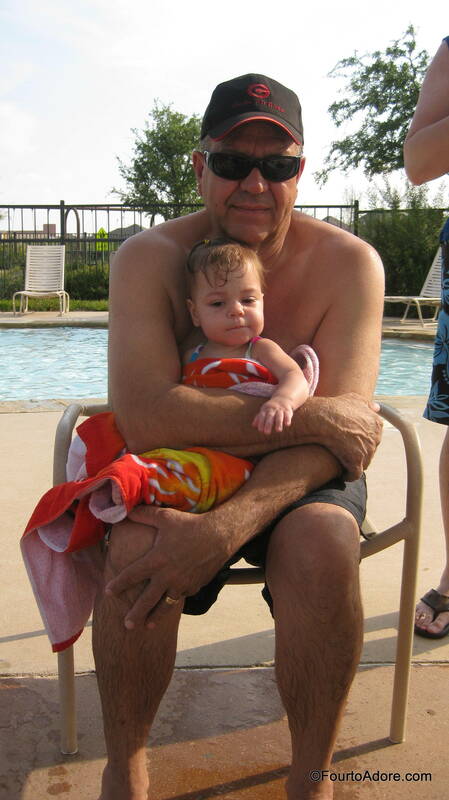 Grandpa snuggled Sydney post swim. After we had all the fun in the sun we could handle, we headed back home. As soon as we arrived, I piled all four babies in the bathtub for a scrub down while George and Dad got busy with the grill. Four squeaky clean babies donning fresh pajamas devoured hamburger patties, shrimp, pasta, and veggies. 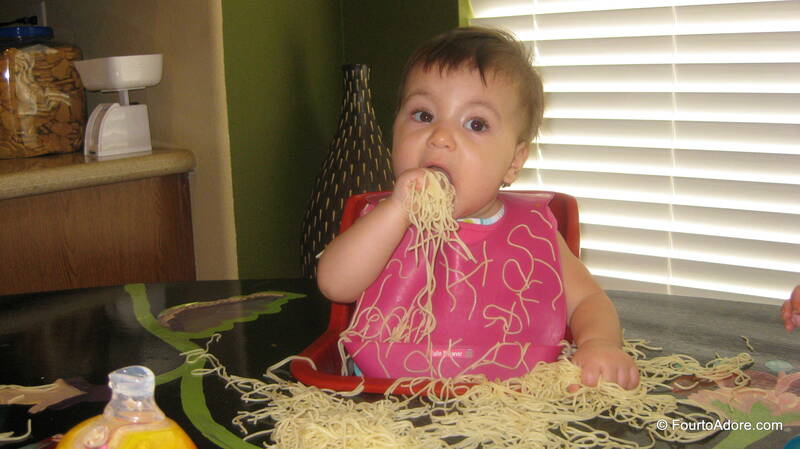 I think swimming revved up their appetites. 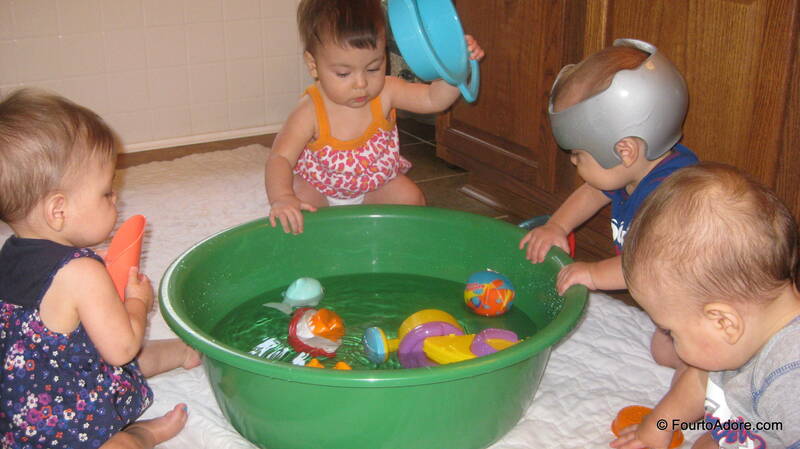 Also thanks to the swimming, the babies drifted off into slumber immediately following dinner. 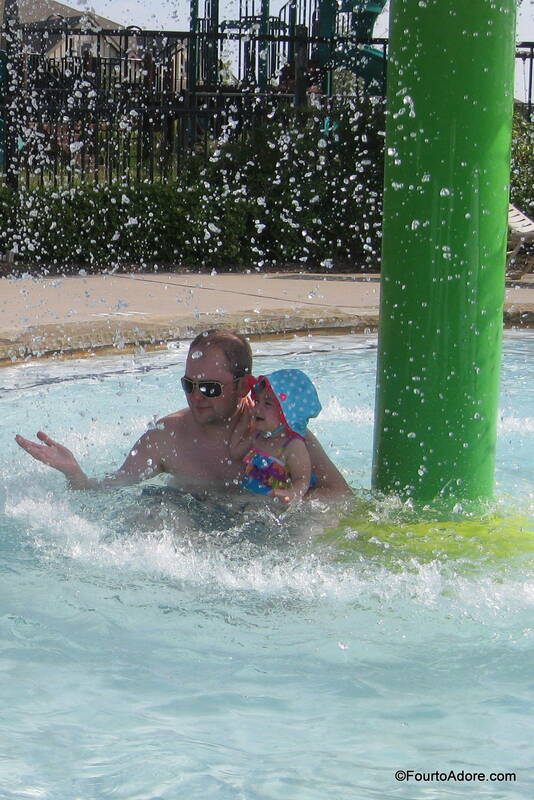 Swimming and sun have a way of zapping energy even from toddlers. This worked to our advantage because the adults enjoyed a peaceful dinner. 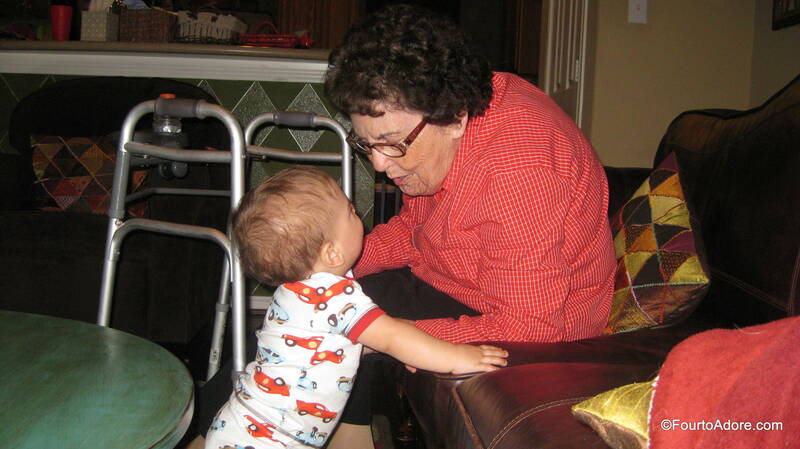 Harper greeted Grandma with his big toothy grin. 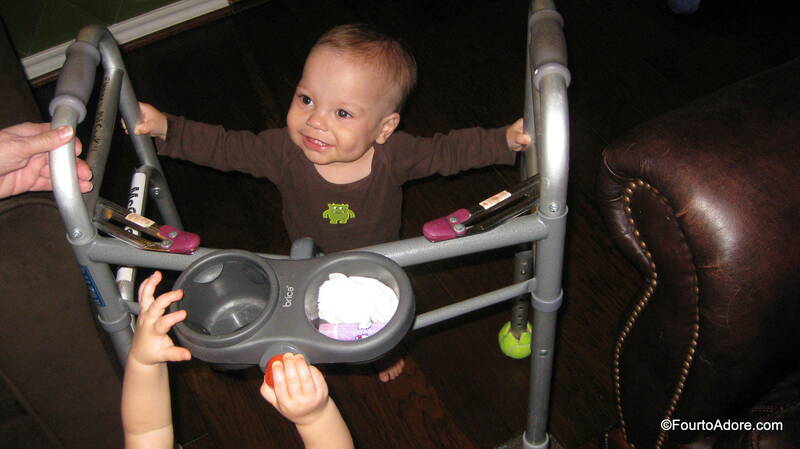 Being a novice at walking, Mason hijacked Grandma’s walker. By the time Monday rolled around, George and I had no energy in the reserves for another outing. Instead, we decided to have a home adventure. 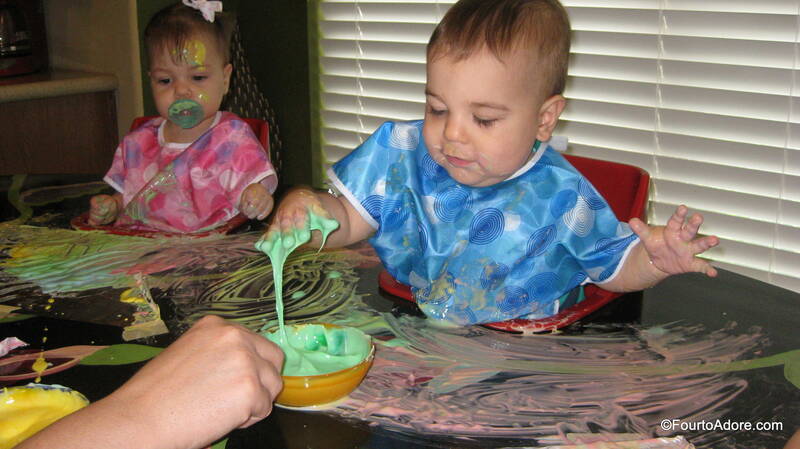 We whipped up edible finger paint for a sensory/ art experience. 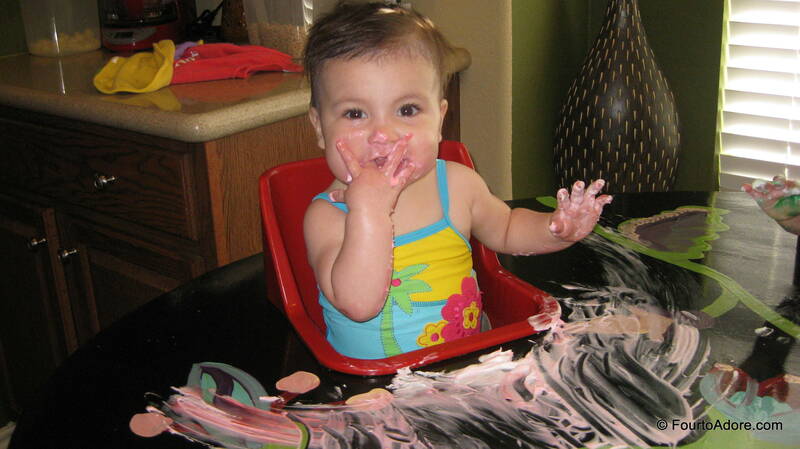 Because the paint was a bit goopy, I knew it would destroy paper. 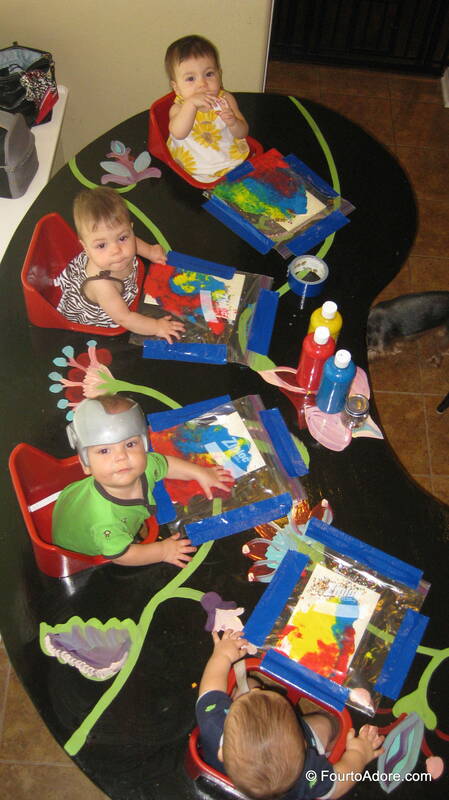 Instead, we taped foil to the table as canvas for our masterpieces. This seemed like a brilliant idea. 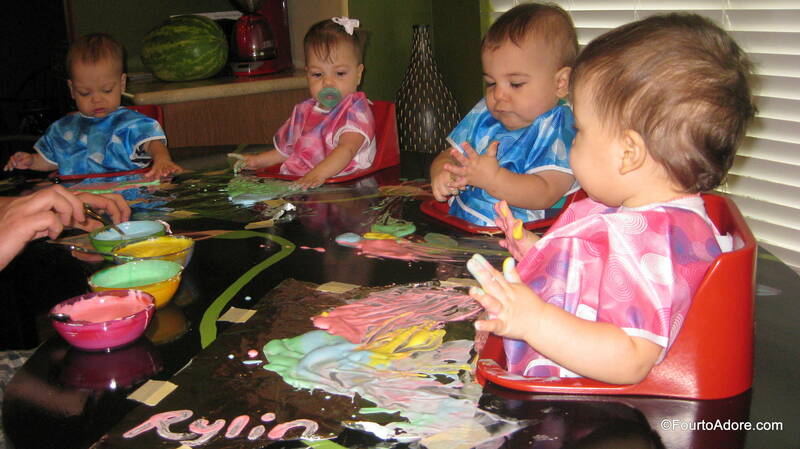 Before we doled out paint, the babies enthusiastically patted the paper watching the shimmery stuff create a metallic tinkle sound. 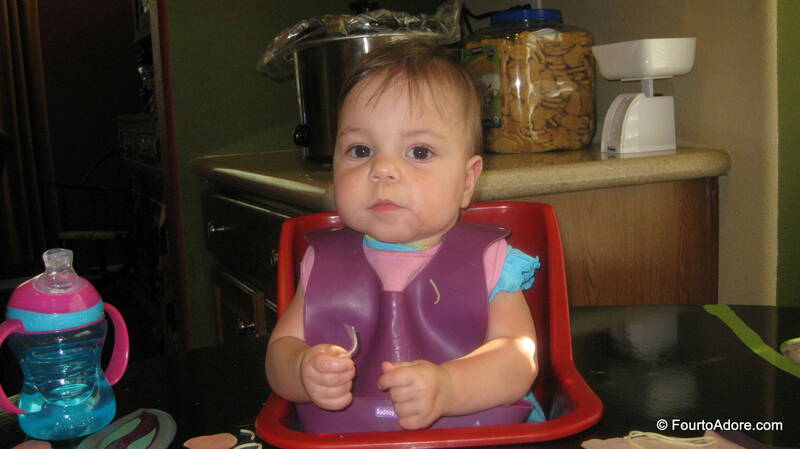 About a nanosecond later, Harper pulled his off in strips and made a snack of it. 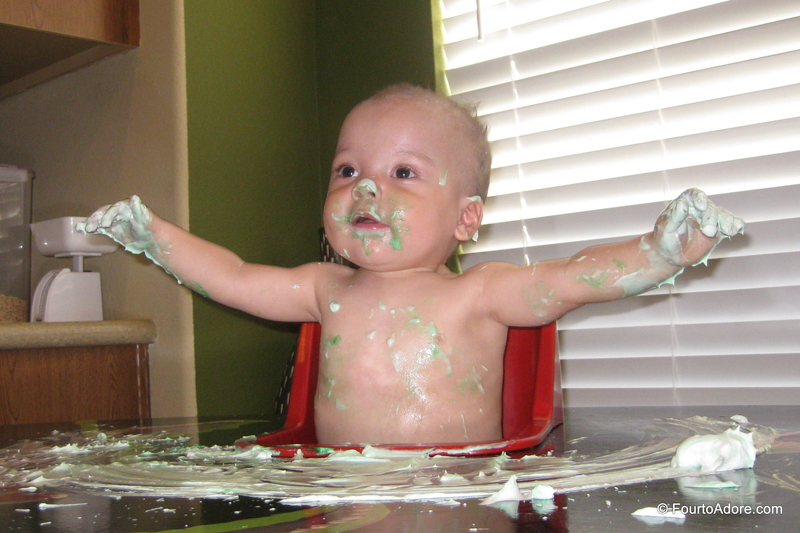 The other babies temporarily kept their foil, but they soon figured out how to pull it off. 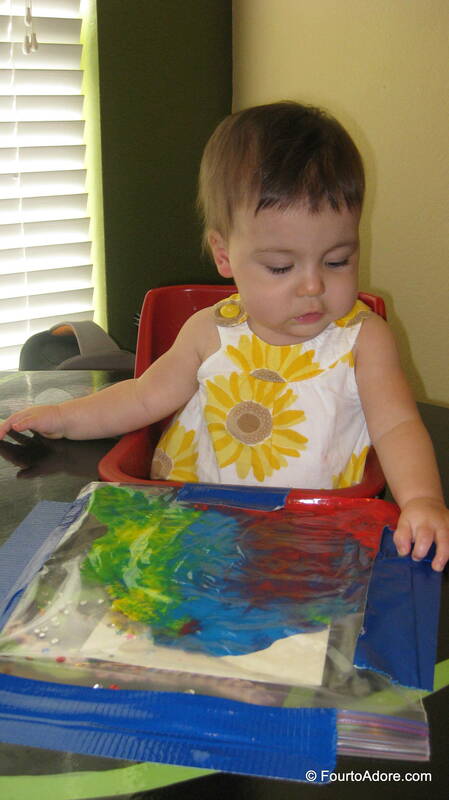 That put a damper on our foil canvases, but everyone enjoyed playing in the paint anyways. 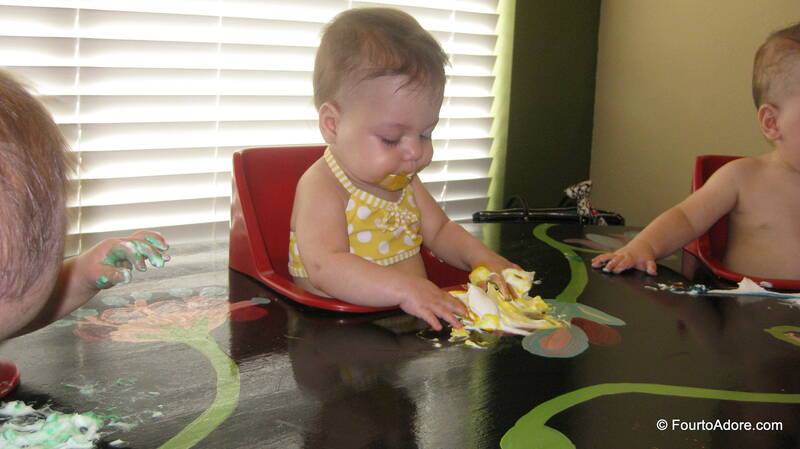 Sydney is not typically allowed to have a pacifier outside of her crib, but we let her during sensory play because it helps calm her with otherwise overstimulating sensory experiences. 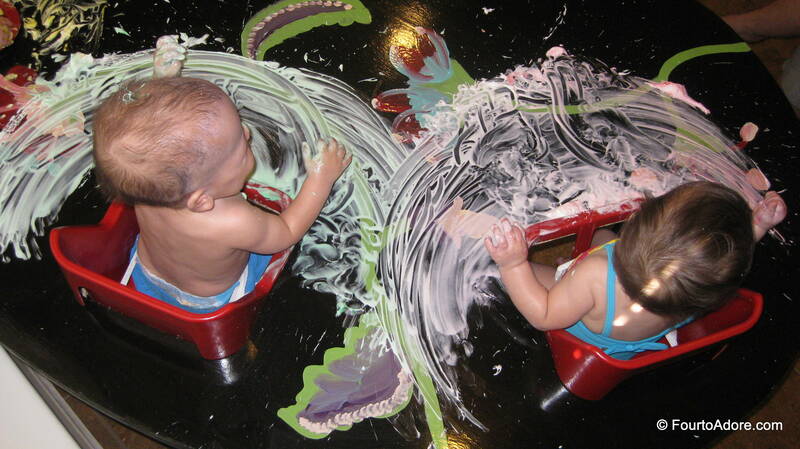 The cornstarch in the paint created a nice gooey consistency that dripped slowly. 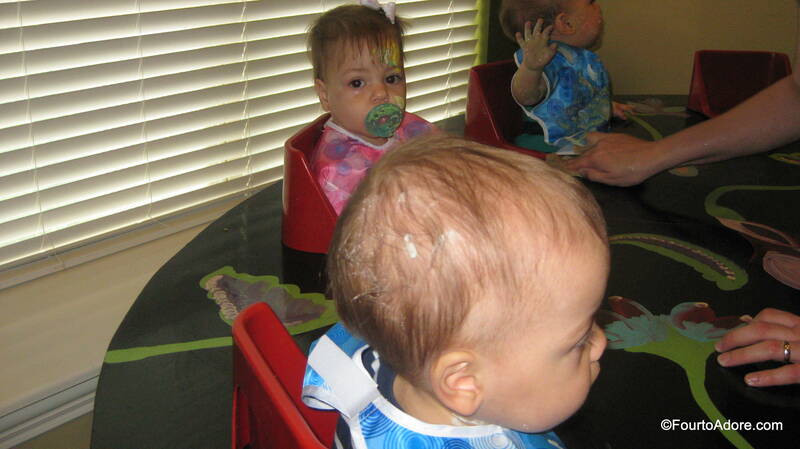 Mason rubbed a little paint on the back of his hair while Sydney did some forehead painting.